A parcel from the nice folks at Amazon arrived on my desk today. Inside were two books. One was the latest Field of Glory Napoleonic lists and the other was this gem from Philip Sabin. Having enjoyed his Lost Battles I was looking forward to this work as well. Were it not for the necessity of putting the man cave (Thomo’s Latest Hole) in order before madam arrives on Monday, I certainly would have had my feet up tonight, cup of lapsang souchong ((literally “Small plant from Lapu mountain” is a black tea originally from the Wuyi region of the Chinese province of Fujian.It is a smoked tea because lapsang leaves are traditionally smoke-dried over pinewood fires, taking on a distinctive smoky flavour. Lapsang souchong is the first black tea in history, even earlier than the famous Keemun tea)) in hand and this book in the other. 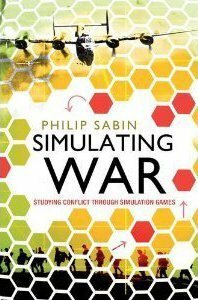 The book itself puts the case that wargames are an excellent tool for examining tactical and operational military history. Having played wargames for longer than I care to admit, I have been noticing in many of the games that whilst combat resolution and morale determination still are somewhat random, the use of good tactics generally pays off and more importantly, the command and control pressure is better simulated now than when I first started. Having enjoyed Lost Battles, I think Simulating War is a next step and one that I am ready to take … now where did I put that tea? You can this from Book Depository UK.